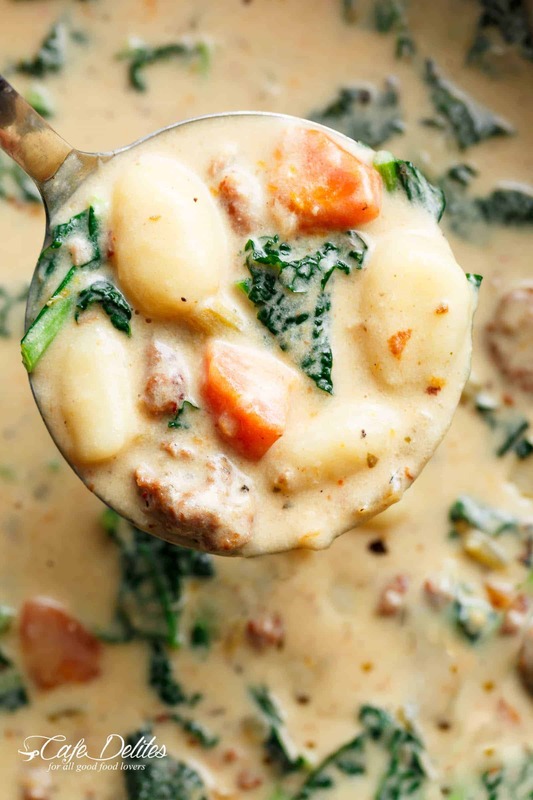 Slow Cooker Creamy Gnocchi Sausage Kale Soup is thick and creamy comfort in a bowl! 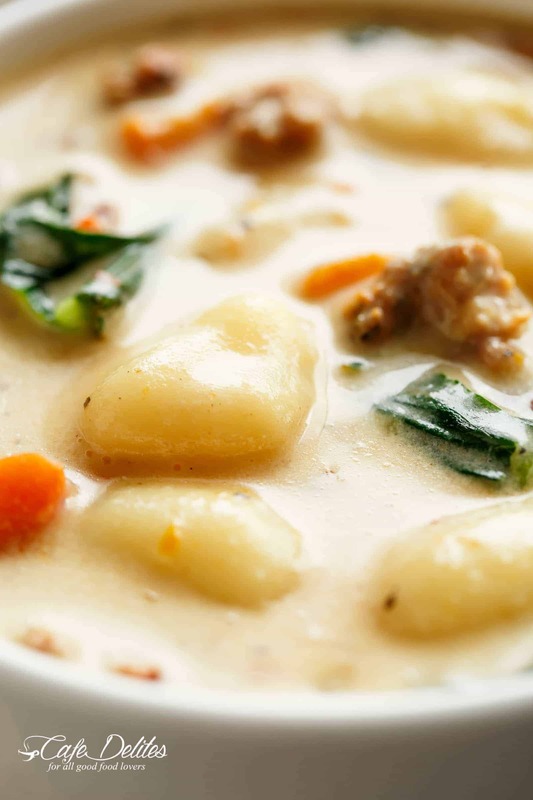 Almost like a fully loaded Zuppa Toscana, this Slow Cooker Creamy Gnocchi Sausage Kale Soup is absolutely incredible, with a guilt-ridden sinful taste BUT only half the calories of regular creamy soups! It’s the addition of gnocchi (also known as soft and pillowy dumplings) that make this soup a family favourite! Put on your sweats and fluffy socks, and get ready to welcome winter with open arms and a bowl of heaven! 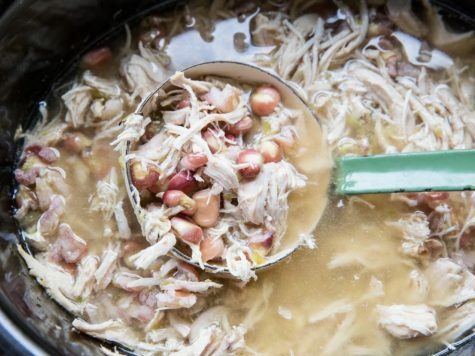 This soup is so addicting, the leftovers are eaten before getting the chance to be turned into leftovers! 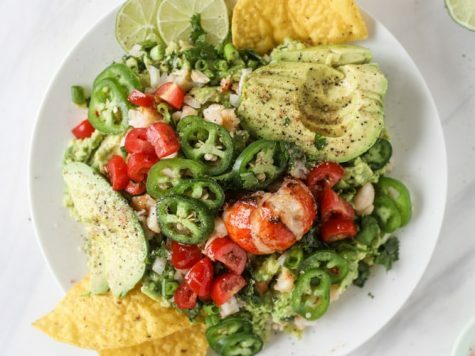 I’m giving you so many options in this recipe to custom-make it to your own tastes! First, I used a low fat Italian sausage I found at my local butcher. 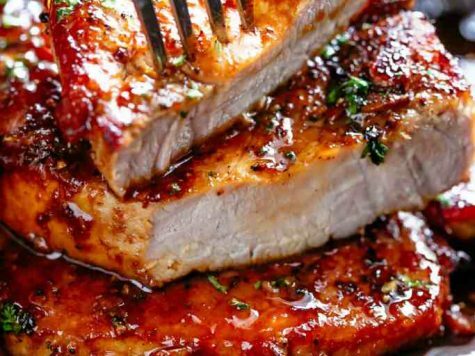 You can also use chicken sausage, normal beef or pork sausage, or even turkey. Just make sure the sausage you use is Italian (that’s where some of the flavour is)! Next, you can use spinach instead of kale. 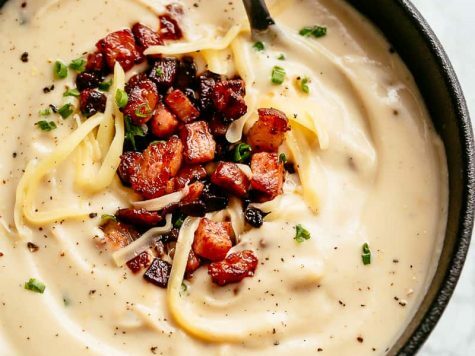 Also, you can top this soup with crispy bacon if you wish! There’s so much flavour in this soup already, we didn’t need to add a thing. However, taste and preference is such a personal thing that you’re more than welcome to make it toy your own tastes. Another thing I do in this recipe is use evaporated milk instead of thickened or heavy creams. Of course, you can use either, or even a combo of both! As you can see down here ↓this soup is so thick and creamy with evaporated milk that you won’t notice the absence of heavy cream. But once again, it’s your choice. While I really want to call this soup a Zuppa Toscana (a popular soup made at the incredible Olive Garden), I feel that this one is loaded with so much flavour, it makes a world of difference! Looking for more soups? Try these: Slow Cooker Creamy Tortellini Soup | Roasted Tomato Basil Soup | Thick & Creamy Pumpkin Soup | Creamy Chicken Noodle Soup | Easy Slow Cooker Lasagna Soup | Chicken Corn Vegetable Soup! 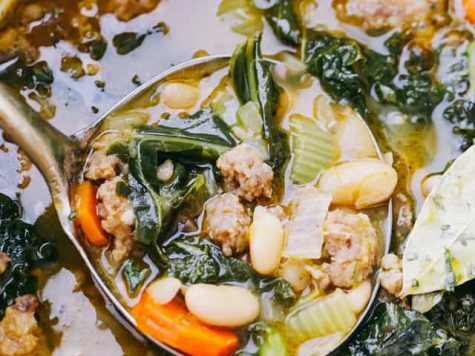 Slow Cooker Creamy Gnocchi Sausage Kale Soup is comfort in a bowl! 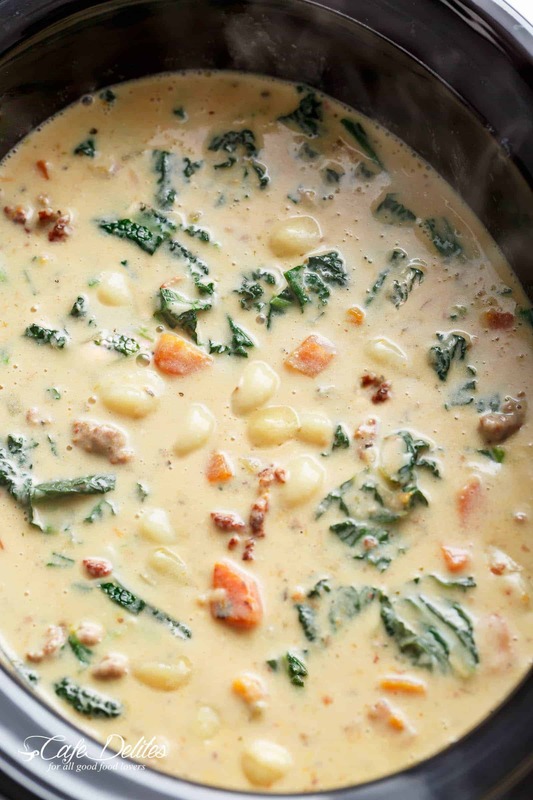 Almost like a Zuppa Toscana with low fat options and full fat flavours! Place the browned sausage, onion, carrots, celery, garlic, broth, Italian seasoning, Vegeta (or bouillon), onion powder, garlic powder, salt, pepper in a crockpot or slow cooker. Cover and cook on high for 4-5 hours or low for 6-8 hours. Add the evaporated milk (or half and half or cream), milk/cornstarch mixture and gnocchi. Stir and replace cover. Cook another 30 minutes until the soup has thickened and the gnocchi has softened. Add in the chopped kale (or spinach), cover for an extra 5 minutes or until just beginning to wilt.